Werner Absenger is a PhD Candidate in the Saybrook University School of Mind-Body Medicine, with a specialization in healthcare research. 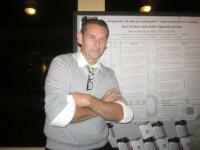 On October 5, 2013, he delivered a presentation to the Society for Clinical and Experimental Hypnosis, based on his current doctoral research utilizing hypnosis to influence immune function in cancer populations. Absenger summarized an exhaustive review of 1586 articles in 22 databases to identify credible studies in which hypnosis was used to modify cytokines. He found only six credible studies, with a total of 133 participants. One of the six studies studied chronic illness. Absenger reviewed the research models and findings of the six studies, and cited several of the authors, who concluded that hypnosis can modulate the immune system. Johnson et al. (1996) found significant correlation between a measure of creative imagination and Interleukin-1β (IL-1β) levels, and reported that only the hypnosis group showed an overall reduction in IL-1β. Goodin et al. (2012) concluded that hypnosis may be effective in modifying soluble Tumor Necrosing Factor aRII (sTNFaRII). Kiecolt-Glaser et al. (2011) concluded that hypnosis was instrumental in balancing systemic Interleuukin-1β (IL-1β) toward desired levels. Mawdsley et al. (2008) reported that hypnosis significantly reduced Interleukin-6 (IL-6) by a median of 23% in healthy subjects and a median of 53% in patients with active ulcerative colitis. The relevance of this finding is reinforced by their additional finding that the IL-6 serum levels were three times as high in those patients with active ulcerative colitis, compared to those with dormant disease. Absenger critiqued the scarcity of relevant research on hypnosis and immune function. In the past 10 years, only four articles were published investigating the immunomodulatory effects of hypnosis on cytokines. Since 1996, only the Mawdsley et al. (2008) study used an actual clinical population, whereas all other studies utilized healthy normal subjects. The conclusions of Absenger’s extensive literature review are that future research needs to further investigate the impact of hypnosis on modulating cytokines and enhancing immune function. In addition, Absenger provided a poster presentation for the SCEH conference, based on a pilot study, in which he studied the effects of hypnosis on healthy subjects. In the pilot study, two hypnosis groups (online and face-to-face hypnosis) showed similar short term increases in IL-1β, while the control subjects showed decreases. Werner Absenger will pursue this research further in his doctoral dissertation through the Saybrook University School of Mind-Body Medicine, using hypnosis to modulate cytokines in a cancer population.